Location: To S of minor road from Pendine to Amroth approximately 3km W of Pendine. Anglican parish church, C15 with substantial W tower and short nave without chancel. Medieval stone vaulted porch. N aisle added 1844-5 to designs by William Garratt of Garness. Restored in 1894-5 by H. Prothero of Cheltenham for £500. This work included new roof, new windows and new fittings. Until 1840, the church was used as the village school with boys taught on first floor of tower, and girls below. Church, rubble stone with slate roofs and coped gables. Big C15 W tower, short nave with broad S porch, and N transept. Tower has battered plinth with chamfered moulding above, tall main part with very small rectangular louvred openings to S and unusually deep corbelled embattled parapet. SE stair tower has embattled parapet at same height. Small flat-headed 2-light late C19 W window. Nave has late C19 flat-headed 2-light window each side of porch, small single-light to right, set lower and possibly restored medieval, with trefoiled head. Three-light E window similar to nave 2-light windows. Porch has eroded segmental-pointed doorway with stone voussoirs. Stone vault within and stone seats, stoup to right of inner door which has pointed C19 ashlar surround, chamfered with late C19 double doors with strap hinges. N transept has N 2-light window. Whitewashed plastered interior, single space with late C19 4-bay roof with collar-trusses with king posts and boarding behind rafters. Plastered medieval stone vault under tower, open to nave. Small segmental-pointed S door to stone winding stair, deep splay to W window. Low whitewashed wall to right of entry differentiates chancel, with 2 fossiliferous marble steps. Segmental pointed doorway into N transept, now vestry, opposite S door. Red tile chancel floor, black marble single step to sanctuary with wrought iron uprights to rails with IHS shield, and single step to communion table. Vestry has 2-bay roof and tiled floor. Pitch pine fittings: simple square 2-panel pulpit (possibly mid C19) raised over chancel low wall. Plain pews and stalls. Whitewashed square medieval font on round shaft. Stained glass E window of Crucifixion with SS Mary and John c1900. Nave S first 2-light window of 1924 by Jones & Willis, nave S second 2-light window of Sarah and St Lawrence to Sarah Lewis (d 1905) and third single-light of 1992 signed by M.G. Lassen of Lulsgate. Wall-plaque commemorating enlargement of 1844 in vestry, also some earlier C19 open back pews, and parish chest of 1815. Included as a restored medieval church with fine W tower. About 7m S of porch of Church of Saint Lawrence. Church is S of minor road from Pendine to Amroth approximately 3km W of Pendine. 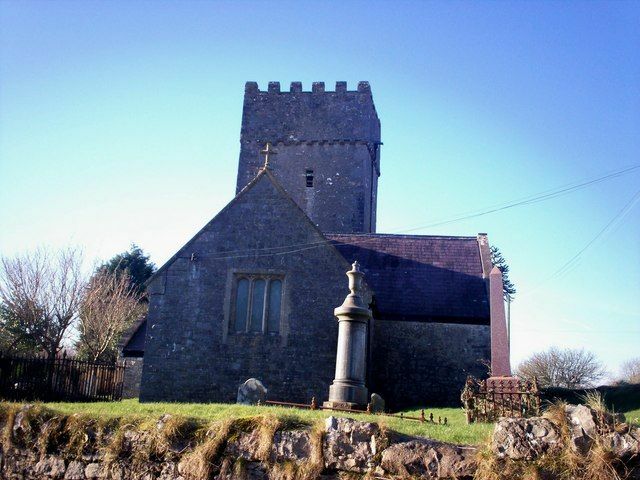 Situated just E of the Church of Saint Lawrence, S of minor road from Pendine to Amroth, approximately 3km W of Pendine. Situated on the N side of Marros Mountain some 700m NE of the Church of Saint Lawrence.